The only woman among the top 10 Congressional repeat guests is Dianne Feinstein (right) of California. 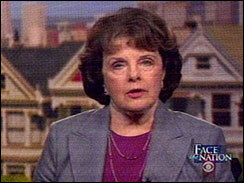 Feinstein is a U.S. Senator rather than a Representative. She is white, and she has held office since 1992, well over the 6-year point that Mitchell uses to mark seniority. A few characteristics set her apart, however: she is a Democrat, and a woman.